WITH two studio albums under their collective belt, in addition to 2014’s acclaimed live Troyk-estra big band recording, heteroclite jazz trio Troyka have always sought to use their combined creative genius to create something extraordinary. As if to illustrate the point, following a resounding Kings Place Festival taster gig a few years ago, a chap in the row behind enthusiastically turned to his wife as the final applause subsided, asking, “What did you think of THAT? !”… only to prompt the deflating reply, as she rose to her feet to exit, “Uh, not MUCH”! Exactly the kind of divided and controversial response (electric guitarist Chris Montague gleefully explained to me later) that they thrive on. 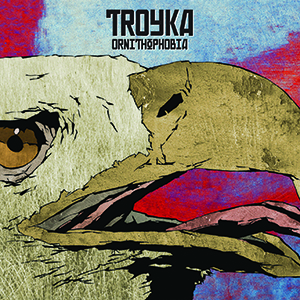 For Troyka are not just any old jazz combo, but rather a triumvirate of like-minded wizards who soak up all manner of genres and refashion them into their own unique, experimental sound worlds. For the uninitiated, this can initially be a pretty bumpy ride – but once attuned to the band’s ‘way of things’ (live, absolutely compelling), it’s easy to become engrossed in the heightened technical and creative intelligence on display here. Recording for the first time on the Naim label, Montague and colleagues – Joshua Blackmore (drums), Kit Downes (keyboards and tuned percussion) – have upped their game still further with a musical outpouring inspired by the guitar man’s Hitchcockian fear of birds – Ornithophobia. And in a move which widens the scope of ‘the three’, they welcome renowned bassist Petter Eldh to add his considerable weight of experience to production/mixing and, for two numbers, composition. Launching in typically intense character, Arcades crackles to the abrasive guitar/keys perambulations of Montague and Downes, with synthy prog backwash, before relaxing into a pleasingly retro, Keith Emerson-like rock beat. Key to Troyka’s success is the blurring of the scored, manipulated and improvised – and the groove of this opening number almost feels too short (perhaps a live extension is already in the bag!). Life was Transient undulates to an impossible Hammond rhythm, picked at by Montague until irregular synth melodies that Herbie Hancock would be proud of puncture the fluid, pulsating bass-driven momentum. Crunchy title track Ornithophobia thuds to Blackmore’s metallicised percussion, Montague’s rapidity on the fingerboard just extraordinary – and, at every twist and turn, something new arrives to excite the senses. Magpies (black’n’white hysteria from writer Montague!) hits the trance button with a blistering saturation of sound, Kit Downes’ distorted keyboards reminiscent of National Health’s Dave Stewart – and the overall drive is hugely cinematic (movie editors take note). The concept of the album is realised in Thopter (faux newsreader suggesting the BBC’s Fiona Bruce may have been more convincing), rendering in sound the album art’s storyboard horror of the band transmogrifying into avian counterparts; with urgent, clamouring guitar, keys and drums, it results in another irresistible adventure. And sustained, contrasting miniature, Bamburgh (replete with seagull effects) implies the rugged, dune-swept coastal terrain of Northumberland in serene, Eno-suggested ambience. Kit Downes’ The General fascinates with a riff which broods, then accelerates, into a wondrously bluesy lead guitar show from Montague (shades of Knopfler?) – and imagine the ’70s prog rock illuminati queuing up to employ Josh Blackmore! Troyka Smash mesmerises briefly with Eldh’s resampled titbits from Troyka’s catalogue until another impressionistic North Eastern landscape, Seahouses (with helicopter rescue overtones), crashes its waves to shore. SURELY the greatest crime for any creative musician is to stand still – to churn out more of the same, ad infinitum (which, it has to be said, some recording artists are content in doing). But not so, in the case of venturous sax player Adam Waldmann’s ‘Kairos 4tet’. 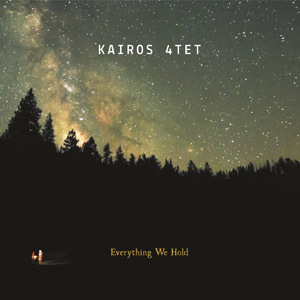 Since their highly promising 2009 debut, ‘Kairos Moment’ and sparkling 2011 follow-up, ‘Statement of Intent’, they have continued to push jazz frontiers to successfully forge a distinctive, progressive path for themselves.